Egyptian Magic is like an all time love of mine. I always have a jar in my nightstand and it's the perfect balm that I have used and sworn by for a number of years. The legend of Egyptian Magic All Purpose Skin Cream tells of it being made with the blessings and guidance of ancient Egyptians. It is a phenomenal healing balm with legendary powers due to its unique mixture of all natural ingredients derived only from living plants and organisms. Kamitian folklore reveals that it may in fact be the exact formula for a legendary skin cream found in ancient Egyptian tombs. The six natural ingredients which make up Egyptian Magic are far less mystical and quite straightforward in fact. They are Olive Oil, Beeswax, Honey, Bee Pollen, Royal Jelly and Propolis Extract. No synthetic chemicals, preservatives, fragrances or parabens have been added and it has never been tested on animals. While the ingredients may seem simple enough, they have powerful moisturizing and healing effects as well as antibacterial and anti-inflammatory benefits to hydrate and promote healing. Olive oil softens and moisturizes. Beeswax creates a protective barrier to help skin to retain moisture. Honey and royal jelly work together to help boost collagen and the antioxidants in bee pollen can help fight free radical damage. The beauty of Egyptian Magic is that it a multi-function ointment which can be used in any number of applications. I originally got this cream to treat dry winter patches. Soon I found myself using it for everything from burns to bruises to bumps to scars and pretty much any type of skin irritation. This stuff is the best for calming the itch and redness from insect bites. It also works extremely quickly to soothe and heal burns. I've used it on my lips, cuticles and even the ends of my hair. It can also help alleviate dry skin conditions like eczema and psoriasis. A friend of mine swore it helped prevent stretch marks when she was pregnant. Even my husband who scoffed and called it snake oil when I first started using it has become a believer when it healed a weird rash he got on his leg one summer. 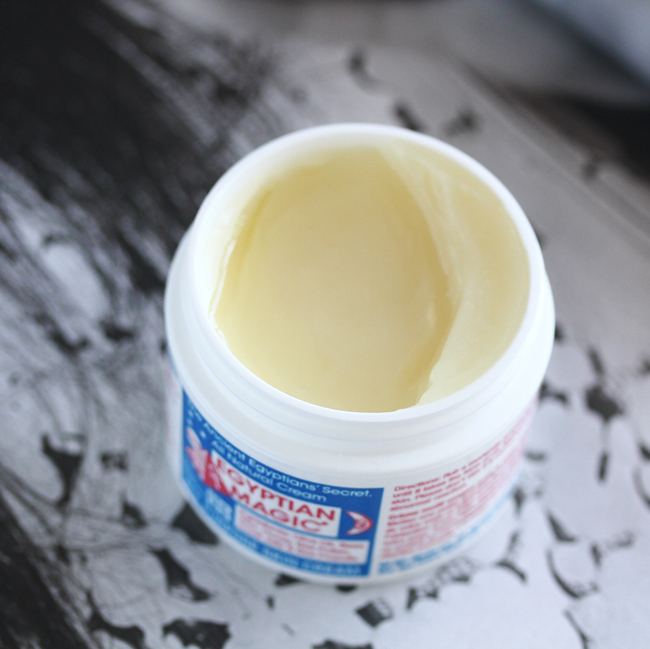 Out of the jar, Egyptian Magic has a texture that is similar to petroleum jelly. To use, you need to emulsify the product between your fingers before rubbing it on. A little goes a long way with this product and though it can feel a touch greasy initially, it absorbs quickly. 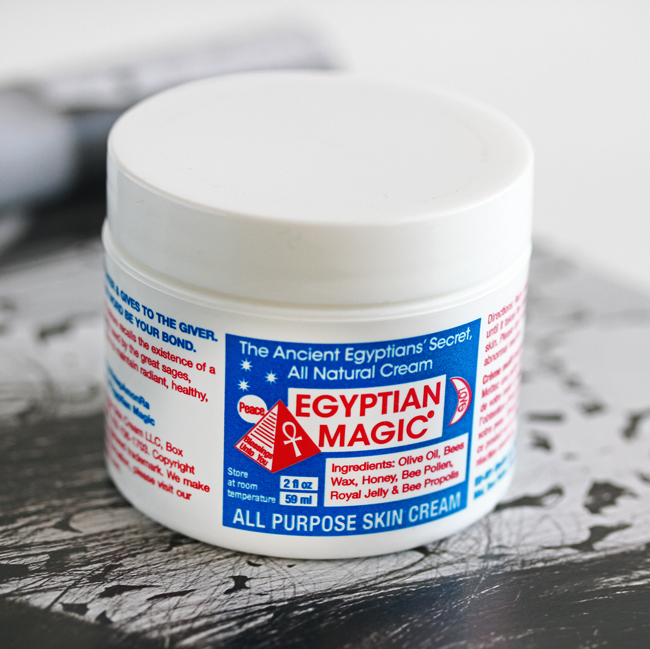 Egyptian Magic is my go to everything balm and will always have a place in my beauty arsenal. I always make sure I pack some when we travel just in case. Egyptian Magic comes in three sizes: 1 oz, 2 oz. and 4 oz. for $16, $21.99 and $29.99 respectively. I always get the 2 oz. size because I can finish it in a timely manner but not use it up too quickly. When I first started using Egyptian Magic, I had to buy it at the health food store but it is now widely available from Amazon, Target, Lookfantastic and Walmart. Just make sure that you purchase it from a reputable seller because there have been fakes reported. This product does contain bee pollen so use caution if you have an allergy to bee pollen or honey. Have you tried Egyptian Magic? Do you have an all purpose balm that you use on everything? Product purchased by me. This post contains affiliate links. I heard so many great things about this cream! I really have to try it! One jar that do so much to heal need to get it definitely will reduce the amount of product I use. This looks lovely! I've heard about it and seen it on a few lists, but never got around to trying it myself. I especially love the natural ingredients since we have a little one with sensitive skin. We've used Burt's bees balm (petroleum and beeswax?) and California Baby (calendula cream) which has been ok. Sounds magical indeed.. thanks for sharing! I never heard... but sounds truly magic! I would like to try it! This cream does sound like magic in a jar! Glad to know it works! I love honey and olive oil. The bee pollen sounds quite interesting. I'll have to see if I find it the next time I'm at Target (which is practically all the time). This sounds heavenly and I'll need to buy a small one to try. Now that the weather is changing, I'm starting to get tiny patches of rash on my elbow and maybe this can help it. Rowena, I've always seen it but bypassed it (for the same reasons your husband mentioned) HaHaHa I'm now a believer! Wow, it has so many uses. Will definitely pick up a jar and give it a try. 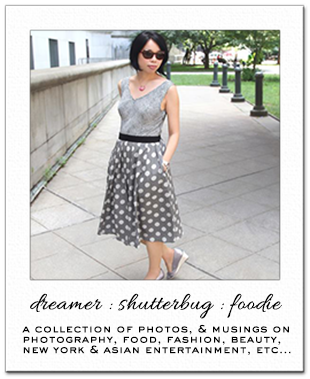 Thanks for showcasing it! I am absolutely going to try this. Thanks. I have never heard of this before but sounds fantastic and exactly something I need to find more about! Thanks! Oh wow I have never heard of it, love the name, it is up there with Snake Serum hahaha. I may allergic though with the bee pollen. It is funny but any time I use ANY Burt's Bees products I get some kind of reaction. Be it a rash or my skin peels or itchy lips. I think it is the bee pollen. I’m loving all the skin care products you are posting. Of course I’ve never heard of Egyptian Magic but I’m always looking for a magic skin cream :) I hope I can find this product in the states. I need to try this on the scar on my hand! I've yet to try this cream, but I do like that it's got all sorts of bee-related ingredients, many of which are my favorites! This definitely sounds like a nice all purpose product to have around the house! I don't have an all purpose cream like this one, but the price point and the short but sweet ingredient list do tempt me. Hello Rowena, it's the first time I've heard of this Egyptian cream, but for its components, especially honey, which is very beneficial for the skin, has to give good results. Thanks for share your experience with us! I know that beeswax is great for our skin and I bought products that contain it, but I've never heard about Egyptian magic cream. It sounds really great.